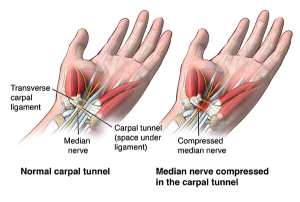 Carpal tunnel syndrome is irritation of the median nerve in the wrist as it passes through the carpal tunnel. It occurs when the space for the carpal tunnel decreases causing increased pressure on the nerve. The increased pressure leads to lack of blood flow, compression of the median nerve and nerve irritation (numbness, tingling, burning, weakness). 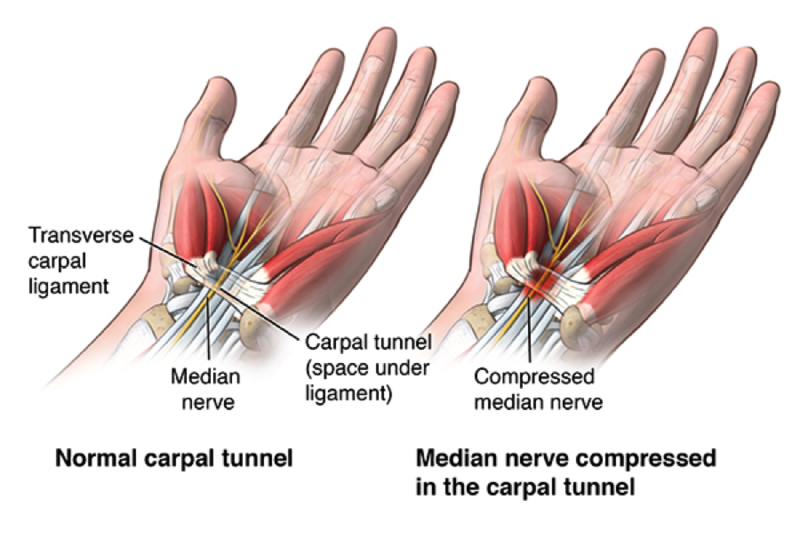 The carpal tunnel is a narrow passageway in the wrist, which is formed by small wrist bones (carpal bones) and a strong band of connective tissue called the transverse carpal ligament. The median nerve and the flexor tendons of the forearm and wrist that bend the fingers and thumb all pass through the carpal tunnel. All of the nerves of the upper limb exit the spinal cord at the neck and then branch into various nerves to supply sensation and movement to the shoulder, arm, forearm and hand. The median nerve branches from the bundle of nerves at the shoulder (brachial plexus) and travels down the front of the arm, forearm, and wrist and into the palm of the hand to supply the thumb, index, middle and 1/2 of the ring finger. Carpal Tunnel Symptoms: What does Carpal Tunnel Syndrome Feel Like? Decreased fine motor control of the fingers. If it is a true carpal tunnel syndrome the above symptoms will be felt specifically into the palm side of the: thumb, index and middle finger and the first 1/2 of the ring finger. Symptoms may be felt at any time of day or night but it is common for initial symptoms to appear at night or after waking up in the morning. Prolonged position of the wrist in flexion or extension. At Mountain Health & Performance we diagnose carpal tunnel syndrome based on a clinical history and examination. Specific palpation, orthopaedic and functional tests will be utilized to rule in or rule out other the cause of your symptoms. If symptoms are severe patients should have nerve conductions studies completed. Nerve conduction studies measure the speed at which the nerve fires by stimulating the nerve with electrical impulses and recording the time it takes for the signal to travel from one place to another. If the firing of the median nerve is delayed then this may signify compression or injury to the nerve. I have tingling in my hands does this mean I have carpal tunnel syndrome? Other conditions can cause numbness, tingling or burning into the hand and fingers. It is common that patients have been diagnosed with carpal tunnel syndrome when they have nerve compression somewhere other than at the carpal tunnel. For example, if there are symptoms in the 4th and 5th fingers this indicates that the ulnar nerve is involved and is not a true carpal tunnel syndrome. 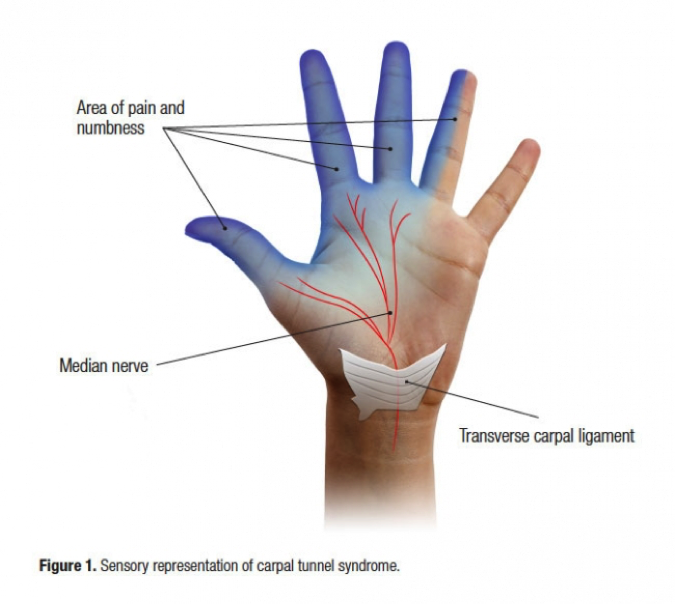 If the whole hand is involved (including the palm) or if symptoms also extend into the forearm, it is likely that there is compression of the nerve higher up. Nerve compression can occur anywhere along the course of the nerve meaning that the problem could originate in the neck, shoulder, arm, or forearm as well. Often patients present with carpal tunnel-like symptoms and but may actually have thoracic outlet syndrome, which is compression of a bundle of nerves at the shoulder. Triple or double crush syndromes can also mimic carpal tunnel syndrome. In a triple or double crush syndrome there may be compression of the median nerve at the carpal tunnel as well as at the shoulder, neck, or forearm. ART can be a very successful technique for treating carpal tunnel syndrome (CTS) due to ART’s ability to both find the specific tissues that are restricted, and then physically work them back to their normal texture and tension. ART’s hands-on methodology releases the median nerve from its abnormal attachments to the muscles, tendons, ligaments, or connective structures that are causing the nerve compression syndrome. Once the actual areas of restriction have been located, ART procedures can be used to release the areas of nerve entrapment. During the ART treatment, the practitioner will take the affected area from a shortened to a lengthened position while having the patient move the arm in the appropriate direction. Depending on the location of the entrapments, the practitioner may use different combinations of ART protocols to release the restrictions; thus, your treatment may vary considerably from that experienced by another patient with CTS. ART treatments for CTS should address all possible nerve and vascular entrapment sites. As discussed above the median nerve may be entrapped at various locations from the neck to the carpal tunnel at the wrist, and it’s important to direct treatment at all affected locations. Functional Range Release technique (FR) is a comprehensive system of soft tissue assessment, treatment and rehabilitation that was designed using the most current scientific knowledge to ensure the highest quality care. FR does not only function to treat injuries it is also used to improve the quality of a person’s movement and to promote joint health and longevity. Manual therapists trained in the FR® system will first take a comprehensive health history in order to better understand not only your specific problem, but also to learn about how your body currently functions. Following this, the practitioner will utilize their hands in attempts to feel (or “palpate”) where the problematic tissues are as well as to define the problem specifically. Once the abnormal tissue is located and defined, FR® practitioners will utilize specific manual release protocols to correct the problem. This will include reducing abnormal tissue tension, improving healing, increasing range of motion/flexibility, reducing pain, and improving function. FR is a great treatment option for carpal tunnel syndrome because it allows for specific palpation and diagnosis of the problem. Since carpal tunnel syndrome is a nerve compression issue, releasing abnormal tissue tension to allow for normal nerve function is key to healing. Treatment will also improve blood flow, improve joint function (neck, wrist, elbow, shoulder) and improve the overall health of the muscles, fascia and nerves. Research suggests that laser therapy can improve: pain, grip strength, function and nerve firing. Laser therapy stimulates tissue healing by producing cellular energy and increasing blood flow. There is no specific exercise protocol proven to be effective in the treatment of carpal tunnel syndrome. Nerve gliding exercises have traditionally been used to improve mobility of the median nerve- but their efficacy remains unknown. At Mountain Health & Performance we advise patients on exercises that are specific to their current level of mobility and function. Over stretching may irritate the nerve further so it’s important to follow the advice of your chiropractor. Preliminary evidence also suggests that yoga may be beneficial for some people with carpal tunnel syndrome. These benefits likely stem from the improved wrist and shoulder mobility and strength that comes along with a regular yoga practice. Soft-tissue tension (tension in the muscles, fascia, nerves) is commonly associated with the development of carpal tunnel syndrome. At Mountain Health & Performance we commonly treat desk workers, artists, musicians and power tool operators who suffer from carpal tunnel or double crush syndromes associated with repetitive strain. These patients repetitively use their shoulders, forearms and wrists at work which can lead to a great deal of muscle, fascia and nerve tension, scar tissue & subsequent lack of blood flow to the nerves. ART and FR treatments will help to improve tissue tension, decrease scar tissue, improve nerve gliding and improve blood flow to the tissues. It’s important however that these treatments are reinforced by specific exercises. Functional Range Condoning (FRC) is a specific training system, which improves the function of your nervous system and leads to a reduction in pain and injury, improved joint health and increased ability to move freely and easily. With specific FRC exercises our patients are able to maintain the effects of treatment and improve the mobility of the soft-tissues that have become tight, painful and prone to irritating the median nerve or increasing pressure within the carpal tunnel. Make sure that you limit extreme wrist bending (forward or backward) when grasping objects. The wrist should be in neutral alignment. Use a relaxed grip when driving, writing or using hand tools. Take regular breaks when performing repetitive tasks such as typing or mousing. When possible decrease the activities that exacerbate your symptoms. Wear a brace or splint full time or at night. Carpal tunnel surgery involves release of the transverse carpal ligament (which forms the roof of the carpal tunnel). Estimates of successful carpal tunnel release vary from 46-87%. Surgery is indicated based on severity of pain, numbness and or weakness. It is also indicated for those who have failed conservative care (massage, splints, chiropractic, rehab, physio, etc.). For the majority of patients suffering from carpal tunnel syndrome chiropractic management should be the first line of treatment. Book your appointment with one of our chiropractors today!